I recently had the always great opportunity to chat with Rick Villars, Vice President for Datacenter and Cloud Technologies at IDC, who has been advising companies worldwide for over 25 years on network, storage and server technologies, and the evolving relationship between IT and business priorities. 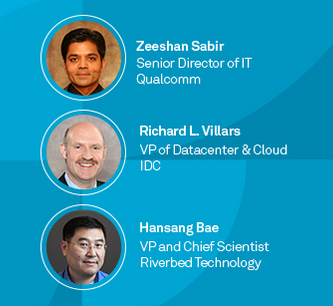 I posed a few questions to Rick in preview of a live virtual event we are hosting on the 10th of March, in which he, together with Qualcomm’s Senior Director of IT, Zeeshan Sabir, and Riverbed Chief Scientist Hansang Bae, will discuss the changing face of IT, as cloud-based applications and the public Internet become more prevalent, and even more critical to business today. Just as in the so many other times when we have had the opportunity to step out of our technology boxes and shift our perceptions about the way things are supposed to be done, today IT organizations are experiencing a shift in the way we define enterprise WAN architectures, all in the effort to help global workforces stay as productive as possible, and with the ultimate goal of generating the maximum potential revenue for their business. The act of putting on the new glasses out of which we view the world around us is never quite the same as like flicking a light switch. Me: Rick, how is enterprise IT reacting to recent developments around cloud, software-as-a service (SaaS), and (increasingly) mobile workforces? What impact has that had on their networks? Rick: For many IT organizations, the issues around cloud, SaaS, and mobile workforces have had more to do with changing the ways business is conducted. It isn’t just about focusing on maintaining systems of record and transactions anymore. IT is trying to help the business develop systems to more effectively engage with employees and customers while also delivering quicker insights. These new systems, however, put a lot of stress on existing wide area networks (WANs). IDC believes that network realignment to better address this new, hybrid IT world must be a top priority for the IT team. Me: What are some of the biggest concerns you hear from companies about integrating new technology and service requirements into the network? Rick: When we talk to WAN managers, almost 90 percent say that they’re engaging in significant realignments to their networks to accommodate new workloads in hybrid environments. The focus of concern isn’t just the technology in their datacenter, however. Many of the new services and capabilities they’re trying to deliver are coming from third party locations such as partners’ datacenters, collocation sites, or cloud service providers. For performance or scalability purposes, IT is trying to manage data and assets resident in many different physical locations and they need a consistent way to track and tune performance across those locations. Me: What would you say are the top three things enterprises should do to ensure optimal application performance, end-user experience, and productivity as their IT environment becomes more hybrid in nature? Rick: The first task is network realignment and this involves looking at new network service offerings and technologies like WAN acceleration that allow organizations to more predictably and reliably deliver content to edge locations and customer sites. As part of that process, companies should also evaluate intelligent network systems that allow them to more quickly re-tune and re-calibrate network flows as workloads vary. Finally, they need to find a way to more effectively monitor the services delivered via collocation and cloud service providers. Whether for collaboration, ERP, CRM, video, voice, VDI, CRP, Shadow IT or even recreation – thousands of applications are consuming bandwidth over a variety of networks in today’s average enterprise. Each and every one of these applications requires a different level of service to different pools of highly distributed workers, and with business priorities sometimes changing on the fly, IT needs to be nimble enough to roll with the punches. And with IT as that critical enabler for the requirements that shape the way businesses keep revenue growing, it’s imperative that IT leaders learn from one another’s experiences, and keep a focused eye on the pulse of change, challenges, pit-falls, and opportunities that can help make the transition from traditional, monolithic network architectures, to agile, more automated, yet hybrid ones, much less daunting. Please join us for a deeper discussion into these important topics on March 10th, as Rick Villars and IT leaders address experiences, challenges, and tips that can help you to champion your business to unprecedented success in the hybrid enterprise.